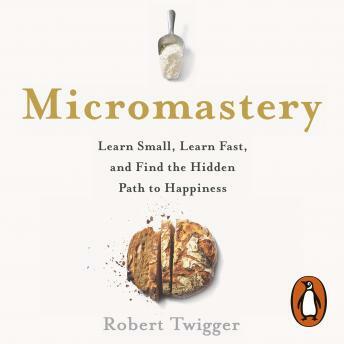 Penguin presents the unabridged, downloadable audiobook edition of Micromastery by Robert Twigger, read by Roy McMillan. We read that we must be passionate about only one thing, that 10,000 hours of hard practice is needed to achieve mastery. But in fact most successful people, including Nobel prize winners, nurture multiple areas of knowledge and activity that feed their central subject. Whether it's making a perfect soufflé, dancing a tango or lighting a fire, when we take the time to cultivate small and quantifiable areas of expertise, we change everything. We become faster and more fearless learners, spot more creative opportunities, improve our brain health and boost our happiness. We see knowledge itself completely differently. The skills acquired in painting a door flawlessly or growing delicious chillies will unexpectedly transform your life. So start small. Start specific. But start - and you'll be on the path to mastery.